Alayne Smith and Sandy Siepman were in the St. Louis airport on Wednesday morning, preparing to board a flight to New York for a "girls' trip," when they learned that their vacation plans wouldn't unfold exactly like they expected. It was a text message from Siepman's husband, telling her that Matt Lauer, the co-host of "Today," the audience of which Smith and Siepman had planned to join Thursday, had been fired by NBC News over allegations of sexual misconduct. "Breaking news," Siepman told Smith in the airport. But on Thursday morning, the show went on, and the girls' trip resumed as planned. Smith and Siepman were two of dozens of people who braved chilly temperatures in Manhattan to plant themselves outside the "Today" studios, where the storied program entered the second day of its post-Lauer era with a broadcast that felt both familiar and surreal. There was standard morning television fare -- a segment on a synchronized swim team comprised of senior citizens and a live performance by the acapella group Pentatonix. But the cloud of the Lauer firing loomed over the proceedings, the topic no more avoidable than the freshly-lit Christmas tree that stood across the street. Before the show, the crowd gathered outside the studios had been briefed by a producer who asked them to refrain from waving and holding signs during what she said would be "serious news" at the top of the broadcast. "As you know, we're dealing with a very sensitive situation right now," the producer told the spectators. "We don't want it to seem like we're making light of the situation." Thursday's broadcast attracted "Today" show diehards, many of whom admitted they were disappointed that they wouldn't see Lauer. But virtually every one who spoke to CNNMoney said they were troubled by his alleged behavior, and applauded NBC for its action. Lauer issued an apology on Thursday, a day after NBC fired him for "inappropriate sexual behavior." "To the people I have hurt, I am truly sorry," he said in a statement provided to CNN. "As I am writing this I realize the depth of the damage and disappointment I have left behind at home and at NBC." "I was surprised, but I wasn't surprised," Smith said of the Lauer allegations. "I think there are a lot of politicians and celebrities that are going to be accused of doing the same thing." 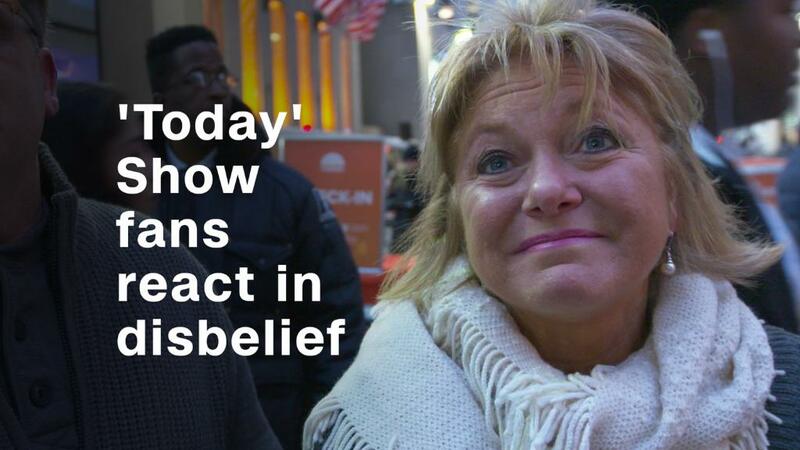 She and Siepman both wondered if there would be a "Matt Lauer effect" on Thursday's broadcast. "We expected there to be less people," Siepman said. But while the news may have dampened the mood at 30 Rock, it didn't appear to hinder attendance. Fans began lining up outside the plaza before 6:30 a.m. Charles Acheson and his wife Elizabeth stood in the pre-dawn darkness, enduring cooler temperatures than they usually face back home in West Palm Beach, Florida. The two came to New York this week to complete what they dubbed the "Rockefeller trifecta": the Rockettes at Radio City Music Hall, the Christmas tree lighting at Rockefeller Center and a live broadcast of the "Today" show. 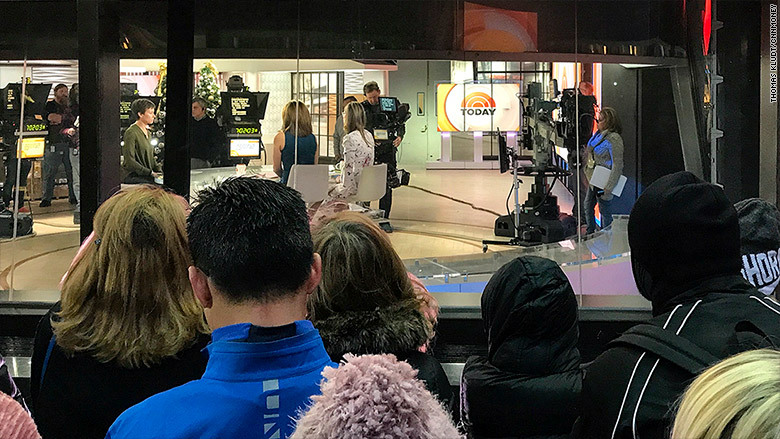 Fans at 30 Rockefeller Plaza in New York City look on as 'Today' co-host Savannah Guthrie reads a statement from Matt Lauer on Thursday morning, the day after he was fired by NBC News over allegations of sexual misconduct. They described themselves as "big fans" of the "Today" show, and both were crestfallen over the allegations against Lauer. "I'm disappointed in him, and very broken-hearted for the ones that were affected, " Charles said. "We were big fans of Matt. There's no question about it." A few feet ahead of the Achesons stood Patty Bontemps, who came to the city from Peoria, Illinois, with her husband to celebrate their 46th wedding anniversary. "It's a changing of the seasons for women," she said. "We loved Matt Lauer," she added. "I was surprised, but everybody has their secrets." At 7 a.m., NBC's iconic chimes rang out from the flat screen televisions mounted in the middle of the plaza, as co-host Savannah Guthrie's voice echoed off the surrounding buildings. "Troubling allegations," Guthrie told viewers during the show's introduction. "More women come forward with accusations against Matt Lauer in the wake of his firing from NBC News." Moments later, Guthrie could be heard reading Lauer's apology on-air, as the fans in the plaza listened in silence.